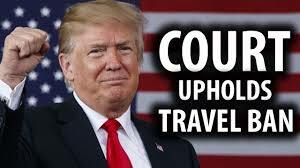 The United States Supreme Court's decision on President Donald Trump's Travel Bank on predominently Muslim countries not only puts all those nations at the top of the hit parede, when it comes to Country Risk, it also increases that chances that the next CBI passport a compliance officer will encounter, when opening a new bank account at his North American bank, will be a citizen from one of those Trump-banned countries. If you are an Iranian or Syrian national, try getting visa-free entry most anywhere; that's why the mad dash is on to the CBI jurisdictions. Compliance officers, do not fret; there is a time-tested method of determining, painlessly, that your passport holder was NOT born there. Listen to him. Each country's native-born citizens speak their official language fluently, and with the accents and slang (or even patois) specific to their place of origin. If you do not have expats from the Caribbean on your New Accounts staff, hire some, for they and they alone will tell you, in a New York second, if your client is a native speaker. Encourage your New Accounts staff to draw out the prospective client into conversation, for it is them that they will be able to alert you to his lack of accent, hestiation wihen discussing his hometown or place of birth, and relatives who supposedly still live there, and rely upon their conclusions.